Description: The P229 was the first pistol to be manufactured in Exeter, New Hampshire. 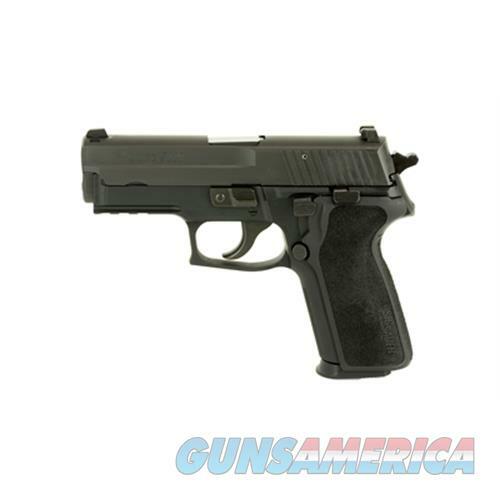 Available in 9mm, .40S&W and .357 SIG, the P229 Nitron is one of the most popular SIG SAUER pistols and carried by thousands of law enforcement professionals throughout the country. The compact size of the P229 makes it ideal for concealed carry. This version has the designed slide profle and ergonomic grip.Features:- Nitron Stainless Steel Slide: A stainless steel slide coated in Nitron resists wear and corrosion- One-Piece Ergonomic Grip: The one-piece, reduced-reach ergonomic grip features an updated stippling pattern- SIGLITE Night Sights: Experience excellent target acqusition even in low light and poor visibility conditionsSpecifications:- Caliber: 9mm Luger - Action Type: Semi-Auto- Frame Size: Compact- Frame Finish: Hard Coat Anodized- Frame Material: Alloy- Slide Finish: Nitron- Slide Material: Stainless Steel- Accessory Rail: SIG Rail- Mags Included: (2) 10 Rounds Steel Mag- Sights: SIGLITE- Sight Radius: 5.7"- Threaded Barrel: No- Grip Type: E2- Trigger: DA/SA- Barrel Length: 3.9"- Overall Length: 7.1"- Overall Width: 1.5"- Height: 5.4"- Weight: 34.4 oz.